Being qualified for forklift certified jobs has many advantages. The pay is good, it does not require loads of training and, wherever you want to work in the country or even the world, there are plenty of forklift jobs to go around. The main types of organization that have forklift certified jobs to offer include manufacturing, construction, airports, seaports and haulage depots. The national median annual salary for a forklift job is around $32,688. Jobs for forklift operators vary little from state to state in terms of earning potential, but in order to qualify for the top paying forklift jobs, you need forklift training and certification. Browse for forklift operator jobs online and apply. Make sure to say you have your certification! Forklifts are necessary machines needed in just about every city in the United States and for a wide variety of projects. 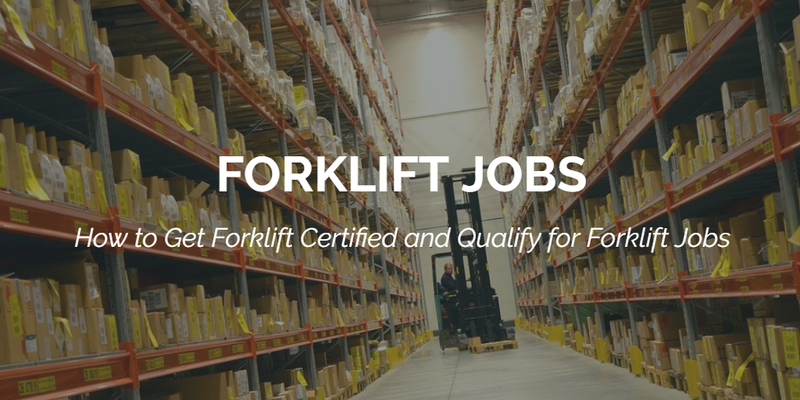 If you have the skills and knowledge to drive forklifts, you have all you need to qualify for a rewarding and financially stable job as a forklift operator. If you’re wondering how to get a forklift job, keep reading. Employers look for job applicants who have completed OSHA-compliant forklift training to provide their workplace with the best, most qualified operators. Not only is this training required by OSHA, but it also helps prevent accidents in the workplace which can lead to costly fines, medical costs, and damage. No matter what kind of forklift job you may want, whether warehouse forklift jobs or construction forklift jobs near me, you need to complete a forklift certification program. This training will provide you with the tools you need to operate forklifts as safely as possible, and the credentials employers are looking for. CertifyMe.net is the number one online forklift school available for new and experienced operators. We teach everything you need to drive forklifts, from operating the controls to performing inspections to recognizing and avoiding hazards. With 100% OSHA compliancy, you can qualify for all of the best forklift jobs in one afternoon for only $59.95 per module. Why Should I Get a Forklift Job? Never wonder, “Are there any forklift jobs near me?” because you know that there are! Work at one of your favorite companies without having to sit behind a desk all day! Some jobs for forklift operators involve driving a lift truck on public roads and highways. Other jobs forklift operators perform may involve operating complex aerial lift equipment, such as the new Elliot E160/215, a 5-axle rig with 215 feet of working height and 1,200 pounds of platform capacity. Alternatively, you could find yourself shifting heavy, delicate and expensive semiconductor-manufacturing equipment around a cold room with a 100-tonne powered industrial truck. There are plenty of jobs forklift operators can do in the great outdoors. The construction, transportation and marine industries all have plenty of forklift jobs for skilled operators. If you prefer indoor work, warehouse forklift jobs are also always plentiful. The options are almost endless when it comes to forklift jobs near me because forklifts are needed for so many different tasks on all kinds of environments! Some of the top companies that offer the best forklift jobs throughout the country include Campbell Soup Supply Company, PepsiCo, Coca Cola, Dr Pepper Snapple Group, Grainger Inc., Ocean Spray Cranberries Inc., GNC, and many more. Nestle is a large national company that’s constantly hiring forklift operators all over the country. Check their hiring page frequently to look for job openings near you. Other top forklift-hiring companies are Randstad USA and Spherion. For more forklifts jobs, check out online job sites like Indeed, Monster, and the websites of companies and businesses to find both national and local forklift jobs near me. Have basic skills in English and mathematics for working out weights and distances. Have previous experience in a depot or warehouse. Are able to work quickly and efficiently, especially during busy periods. Can follow instructions and keep records. Have an awareness of health and safety. Have an OSHA-compliant forklift certification. Training for a forklift job centers around preserving your life and your limbs. If you don’t know how to work on or around a forklift or if you are unfamiliar with OSHA forklift training requirements, there is a substantial risk of serious injury or even death. It’s not rocket science but there are things that you need to learn and learn well. OSHA requirements stipulate that training for forklift certified jobs should consist of formal classroom-style training in addition to instruction and evaluation on job-specific material. The classroom part of forklift job training may be conducted face-to-face or by video/DVD, online content or other form; it is up to the trainer to decide. The job-specific aspects must cover details of the equipment the trainee will be expected to operate as well as information specific to the working environment, for warehouse forklift jobs, construction jobs, dock work jobs, and other forklift jobs. If you think forklift jobs might be for you and you’re wondering where to get forklift certified, contact us at CertifyMe.net. We can help you get your forklift certification quickly and surprisingly cheaply. In as little as two hours, you can grab an edge over forklift certified job candidates who do not already have forklift training and certification to qualify for the best forklift jobs. Now that you’re fired up about the many forklift jobs near me, and you know the type of training you need to look for, look no further than CertifyMe.net! Our comprehensive online forklift training program can be accessed from any device with an internet connection and completed at your own pace to help you qualify for the best forklift jobs. You will learn how to operate a forklift, how to operate the controls, how to perform daily equipment inspections, how to maneuver ramps, grades and blind spots, and how to recognize and avoid hazards. You will also receive the formal instruction you need to move onto the next part of forklift training, which involves the practice training and skills evaluation. That’s it! Once you’ve passed the online course, you’ll need to schedule your practice training and skills evaluation. If you have any questions about our forklift training, how to complete the in person portion of the training, or how to qualify for different forklift jobs, contact us at CertifyMe.net.